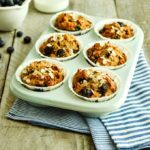 Preheat the oven to 180c and line a muffin tin with 10 muffins cases. In a large bowl mix together the flour, oats, baking powder and baking soda with a spoon. In another bowl or jug add the yogurt, coconut oil, egg, mashed banana, honey and vanilla and mix well. Add the wet ingredients to the dry ingredients and fold until just combined. Then fold in the Add the juice and zest of the clementine’s and the blueberries. Use an ice cream scoop to divide the mixture between the 10 muffin cases. Bake in the oven for 25 minutes until golden brown on the outside and cooked through. These muffins will keep in an airtight container well for 48 hours, or longer in the fridge. They can be reheated in the oven or microwave. They can also be frozen. To defrost simply leave out overnight in a covered container or bowl and they will be defrosted by the morning.